If you are wondering where the best place is to start your search for Chevrolet’s latest models is, check us out at our car dealerships near Waukesha. Ewald Chevrolet Buick has Chevrolet’s latest models to choose from in our large inventory selection at our car dealerships near Waukesha. From a used cars for sale to Chevrolet’s latest models of SUVs for sale, we have what you want at Ewald’s car dealership near Waukesha. If you want to purchase a new or used Chevy SUV to fit your family’s needs,pass by other car dealers in Waukesha WI and get to Ewald. We have the Chevrolet latest models of SUVs to meet your transportation needs. Ewald’s car dealer near Waukesha has a generous selection of Chevrolet’s latest models of SUVs for sale to choose from here. All in a low-pressure, customer-first environment at Ewald Chevrolet Buick. When your life demands Chevrolet’s latest models of SUVs for sale at car dealers in Waukesha WI, check out the like new 2018 Chevrolet Traverse LT. This Chevy Traverse is sure to please even discerning SUV buyers. With 2nd-row captains chairs and 3rd-row bench seating, you can comfortably fit up to seven in this Chevrolet Traverse. So get ready to load everyone in for your next driving excursion when you take on the streets of Wisconsin in this Chevrolet Traverse. This used SUV for sale at our car dealership near Waukesha is loaded with options to ensure your driving pleasure. 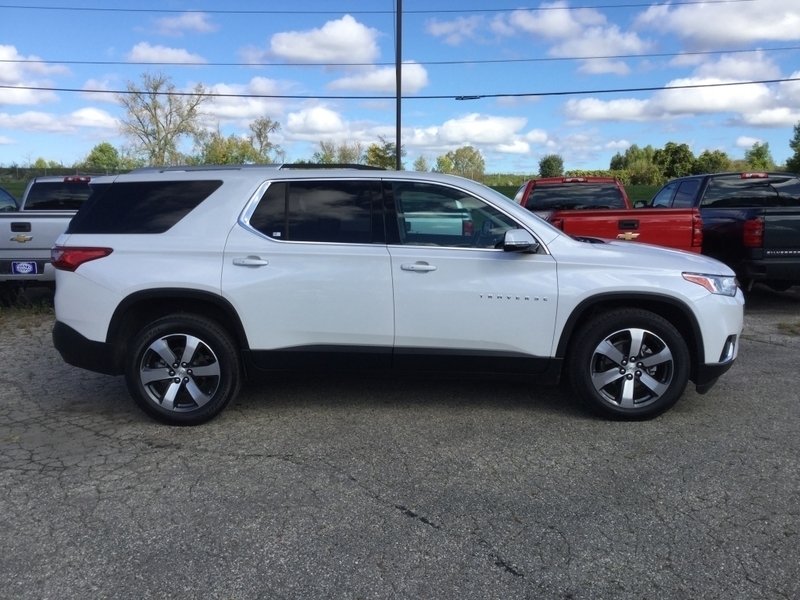 This used Chevrolet Traverse for sale features luxurious leather seats and more. This used Chevrolet SUV for sale even has a power rear liftgate. Talk about ease of entry to load up cargo in this used SUV. You can also find a navigation system, rear park assist, and remote start on this Chevy Traverse. Be sure to come in and test this used Chevrolet Traverse for sale and take it for a test drive. While out test driving this used Traverse, explore all of the wonderful features this SUV has to offer. Such as the rear backup camera, automatic climate control, and Sirius XM radio capable. The stabilitrak stability control system with traction control helps you maneuver the streets of Wisconsin safely. When you find the right Chevy SUV that meets your needs, ask your sales team member about your financing options. We offer some of the most competitive GM Financial finance rates around. So let’s get started on working together to help get you one step closer to driving home in one of Chevrolet’s latest models of SUVs today. When you are looking for Chevrolet car dealers near Waukesha with a variety of new and used cars for sale and used SUVs for sale, head over to Ewald Chevrolet Buick. With a commitment to offering a great selection of vehicles, transparent dealing, and fast and friendly credit processing, Ewald should be your destination for your next vehicle. Find Ewald Chevrolet Buick located at 36833 E Wisconsin Ave in Oconomowoc WI 53066. Or give us a call at Ewald Chevy by dialing (262) 226-2842 to schedule a test drive today.